As day turns to dusk, follow the locals to Mindil Beach for the sunset markets each Thursday and Sunday (photo: Michael Wee). If you’re exploring the Top End, no doubt Darwin will be on the agenda. But don’t just hop in and out on your way to the outback, make the most of your stay in Australia’s only tropical capital city. In 1869, the arrival of George Goyder, South Australia’s surveyor-general, to a small colony in the Northern Territory marked the beginning of the city of Darwin. He was sent here by the South Australian government to facilitate pastoral expansion by establishing a settlement modelled off the city of Adelaide. Named Palmerston after British Prime Minister Lord Palmerston, the settlement of little more than 100 saw quick expansion when the first poles of the Overland Telegraph were erected the following year, connecting Australia to the rest of the world. While digging for this telegraph line, workers found gold at Pine Creek, 200 kilometres south of Darwin, which spawned a gold rush and a huge boom for the settlement. The following century saw a name change to Port Darwin, after naturalist Charles Darwin, in 1911; the country’s first enemy attack when Japanese aircrafts dropped bombs on the city during World War II, killing more than 243 people; the biggest airlift in Australian history (more than 25,000 people) when Cyclone Tracy devastated the city on Christmas Day in 1974; and the completion of the railway between Alice Springs and Darwin in 2003, which now links the city to Adelaide. Today, with a population in excess of 130,000, Darwin is an intriguing mix of more than 50 nationalities and a rich indigenous culture. The city permeates a youthful energy with the median age group at just 31.4 years (ABS: 2011), driven by the trend of young adults who come to the city from across the country and overseas to complete seasonal work in hospitality and tourism. 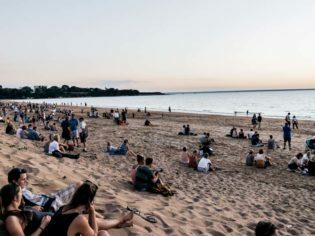 Along with this vitality, the consistent tropical weather, laid-back vibe, and its close proximity to the highlights of the Top End – Kakadu, Litchfield and Nitmiluk national parks are just down the road (in terms of outback distances that is) – the city attracts its fair share of tourists. But more than merely a gateway, Darwin itself is worthy of a few days’ lingering. You may be surprised by what you find in pockets around this relatively small city. To save you searching, we’ve found the hip in this hood for you. In the courtyard of the historic Vic Hotel on Smith Street Mall, The Pearl has a Parisian salon feel with a french inspired menu, and a touch of tropical jungle in its palm-frond wallpaper, greenery and wooden décor. Champagne high teas are held on Saturdays and Sundays with bottomless Champagne, oysters, salmon rillettes, duck liver parfait, petits fours et cetera. Be sure to follow the dress code: fabulous or smart casual; We suggest the former. At the waterfront with water views, The Oyster Bar is a fabulous spot for a sultry Darwin evening, with a great selection of Australian beer and wine, and fresh Australian oysters. Whether you like your oysters raw, smoked or grilled you’ll be sure to find something to your taste on the menu. For those who don’t love the bivalve, there are other options, such as an antipasto platter. There’s also live music on Wednesdays, Fridays and Sundays. Darwin’s modern waterfront has a whole host of restaurants to choose from but our favourite is Chow. It doesn’t have water views but this South-East Asian restaurant holds it own, serving up big bowls of steaming pho, creamy laksa, fresh rice paper rolls and a selection of tasty larger plates. It’s a relaxed vibe with a fun drinks menu: bubble tea cocktails, sake bombs, and ka-pows inspired by the drinks served in plastic bags on the streets of Asia. Little Miss Korea was voted one of Australia’s hottest new restaurants by the Good Food Guide in 2015, this edgy Korean barbecue restaurant is located down an unassuming laneway off Knuckey Street. With an industrial warehouse-style fit-out and colourful street art adorning the concrete walls, diners can DIY barbecue or order à la carte. Photographer Paul Arnold has spent the last 26 years exploring the outback, and his gallery, located off Knuckey Street, showcases a collection of his images from all corners of the NT. It’s worth popping in to simply browse the stunning landscapes of the Top End; or purchase a print to take a little piece of the NT home with you. Recline on comfy deckchairs as balmy nights fall at Darwin’s Deckchair Cinema. 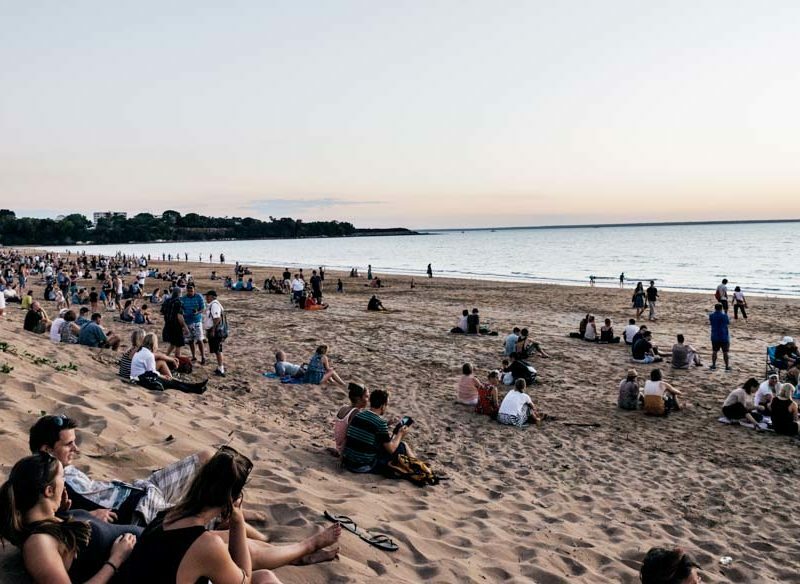 On the edge of Darwin Harbour and set up under the stars, the cinema screens films every night in the dry season, between April and November. Movie-goers can bring their own picnic and drinks (no alcohol) or can purchase beer, wine, soft drinks and snacks there. BYO insect repellent, too! Pop in to get some new threads at this super hip store located on Smith Street. Robbie and the Crew stocks stylish men’s and women’s pieces by Australian labels including Binny, Morrisday The Label, C/Meo Collective and Smith & Jones. Everyone needs a new cossie when on holiday, right? Splash On Knuckey (Street) has oodles of bikinis and one-pieces by Australian brands such as Tigerlily, Seafolly and Isola by Megan Gale. There’s also a range of resort wear, sunglasses, hats and sandals – a wardrobe fit for tropical Darwin.